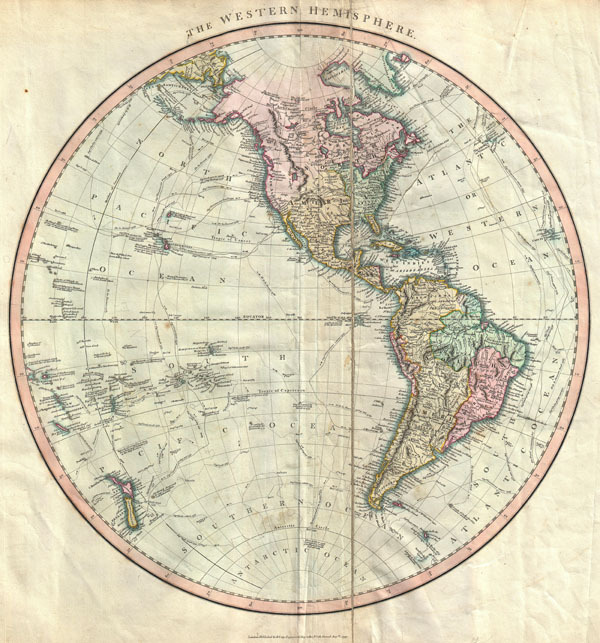 An attractive example of John Cary's spectacular 1799 map of the Western Hemisphere. Covers the entirety of North America, South America, the Pacific Ocean and much of Polynesia. Europe is mapped according to early 19th century form. In North America the fledgling United States extends westward only so far as the Mississippi River. Florida is divided at the Apalachicola River into eastern and western sections. West Florida, ostensibly part of the Louisiana Purchase, was claimed by the Spanish and remained under their control until 1812. East Florida remained under Spanish control until 1821. The South America portion of the map is notable for its excellent detail in the Amazon basin and the massive Spanish holdings extending from Panama south to Patagonia. The routes and discoveries of important explorers are noted throughout and crisscross both the Pacific and the Atlantic. Most notable are the explorations of Cook, Vancouver and Perouse. All in all, one of the most interesting and attractive atlas maps Western Hemisphere to appear in first years of the 19th century. Prepared in 1799 by John Cary for issue in his magnificent 1808New Universal Atlas. Average condition. Minor offsetting. Original crease, offset to the right of center by approximately 1 inch, exhibits splitting and an old verso repair. Would benefit considerable from professional flattening and restoration - price reduced accordingly to accomidate this. Rumsey 1657.002. Phillips (Atlases) 714. The Map Collector, issue 43, p. 40-47 (Atlas). National Maritime Museum, v. 3, no. 311.